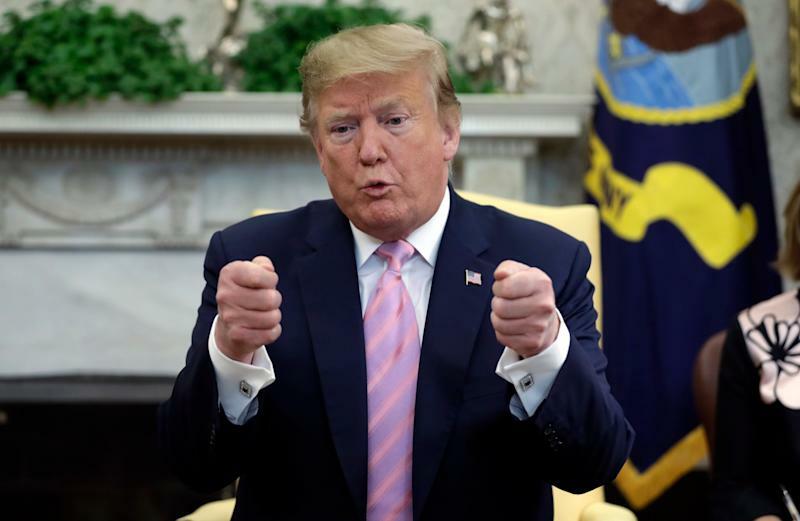 WASHINGTON — The White House declined to comment Tuesday when asked by Yahoo News if President Trump has seen special counsel Robert Mueller’s full report. This silence comes hours after Attorney General William Barr similarly refused to say if Trump had seen Mueller’s report on his investigation into Russian interference in the 2016 election. Barr was testifying before the House Appropriations Committee about the Department of Justice budget, but questions about Mueller’s report dominated the hearing. Appropriations Committee Chairwoman Nita Lowey, D-N.Y., said a brief summary of Mueller’s report that Barr released on March 24 seemed to “cherry-pick from the report, to draw the most favorable conclusion possible for the president." Lowey questioned Barr on whether the White House had been briefed on Mueller’s report and asked if the president or his staff saw the complete document before or after Barr published his summary. Barr, who said at the hearing that he hoped to publicly release a redacted version of the report “within a week,” declined to answer Lowey’s question. Barr’s trio of letters about the Mueller report included his four-page summary in which he said the special counsel found no evidence Trump or his campaign team colluded with Russia. According to Barr, Mueller declined to draw a conclusion on whether Trump obstructed justice in the investigation and left it up to the attorney general to decide whether the president should be prosecuted for that crime. Barr declined to charge Trump with obstruction of justice. The White House and congressional Democrats have been battling over the Mueller report since the release of Barr’s letter. Trump quickly declared Mueller’s report offered him “complete and total exoneration,” but House Democrats have since authorized a subpoena to try to obtain it. Following Barr’s testimony on Tuesday, Lowey stressed Democrats’ desire to see the unredacted document and raised concerns about whether the attorney general shared it with the White House. She suggested the president’s allies could have had input on Barr’s summary of the parts of the public version of the report that will be concealed. “It was clear to me that the attorney general felt that he was an appointee of the president of the United States of America and it’s very hard for me to believe that he didn’t make any changes or additions based on any suggestions that might have come from the White House,” Lowey said of Barr’s comments. Although the White House isn’t saying whether Trump has seen Mueller’s report, the president’s legal team indicated it has not seen the document. Former New York City Mayor Rudy Giuliani and Jay Sekulow, two of Trump’s top personal attorneys, told Yahoo News they have not read the report. Sekulow, however, specified that he could not say whether Trump or the White House have had access to it. “I can only speak for my team. You would need to talk to the White House for other information,” Sekulow said.